“Water is still the most important source of renewable energy in Bavaria, Germany, accounting for some 33 percent of all renewable energy produced in the region, as showed by the Bavarian Energy Map. But conventional hydroelectric plants, especially micro hydro generators, are a subject of controversy due to their low output volumes and their interference with the ecosystem. Fraunhofer researchers are working on an environmentally friendly alternative: in the future, innovative elastomer materials are set to convert the mechanical energy produced by flowing water in small rivers directly into electrical energy. Under its energy policy, the Bavarian State Government has defined new objectives for the transition to a greener energy economy: by 2025, some 40 percent of electricity required in Bavaria should be supplied by local renewable energy sources. In the DEGREEN project (see the box “The DEGREEN project at a glance”), the Fraunhofer Institute for Silicate Research ISC is pursuing an innovative approach to renewable energy generation using hydropower. To this end, the Würzburg-based researchers are using highly flexible and ultra-thin elastomer films that work as capacitors. The silicone films are coated on both sides with a conductive elastic layer and furnished with a protective layer of insulation. They are installed in small rivers and streams where the constant deformation and relaxation of the elastomers converts the mechanical kinetic energy from the water directly into electrical energy. The flowing water deforms the soft film, the characteristics of which are similar to those of a balloon. When deformed, the films carry a high electric charge generated by the stretching process. The elastomer film is then mechanically relaxed to its original state. Changing the diameter of the film enables the researchers to adjust the pressure. Consequently, the generator can be adapted to the flow rate. Comprising films, tube, vent, pump, air duct, electronics and rectifier, the overall system has a modular structure. The tubes, which also have a flexible diameter, are adjusted according to the depth and width of the water and are set up either on top, behind or next to one another. If a river is wide but shallow, it is recommended to mount the tubes next to each other. “One major advantage of our concept is its flexibility: it can be used in water of any depth. We harness the water’s fluid energy. 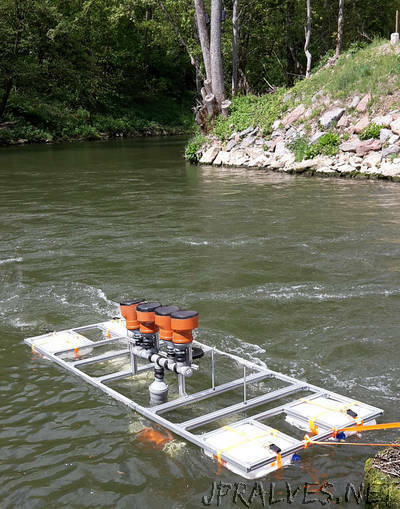 Our elastomer generators are ideal for small rivers and can be operated at flow velocities from as low as 0.5 meters per second and at depths of 0.5 meters. In Bavaria, there are some exceptionally small rivers which together cover a length of some 30,000 kilometers. Our system, which is not influenced by wind or sun, is the perfect solution. If we installed 1000 of our generators, we could help bring Bavaria a major step closer to achieving its transition towards greener energy,” says Brunner. In total, such a system could supply the grid with 876 MWh of power annually. Austria and Switzerland – with their abundance of mountain streams – as well as developing countries would also benefit from this innovative mechanical excitation concept.